The nectarines were sooo calling my name in the grocery store the other day. 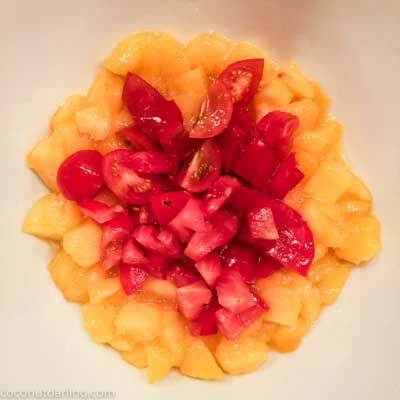 Organic and on sale (I love summertime – so much fresh fruit to choose from)! And then I almost let them go bad!! Don’t you hate it when that happens!? 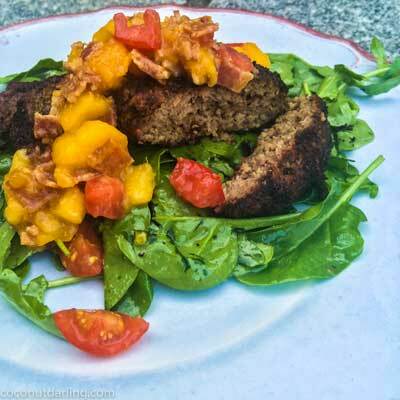 But this was a quick way to use up the tomatoes and nectarines that were on their last leg. And should I mention the bacon? You guys must know by now how crazy I am about bacon…so much so that I’ve even put it on my frozen yogurt. No lie. And I did it more then once. What’s the craziest thing you’ve done with bacon? I assure you I won’t even flinch with the craziness. I would probably just be super excited to have more ideas to bounce off of. What were we talking about? Oh yeah, bacon. It’s loaded with saturated fat (which our bodies actually need) which fills us up faster than carbs do. By increasing your fat consumption and decreasing your carbs, you will experience long-term weight loss. Aaaannndd there is no sufficient evidence to support saturated fats influence on heart disease and weight gain. So drop the hype. Like I said, fats are good for you. Bacon raises your HDL cholesterol (good cholesterol). A high HDL proves for better health and less risks of heart disease. Stop the low-fat diets immediately. They are killing your arteries!! Bacon is low in carbs. Carbs basically turn in to sugar (which affect your insulin levels). When you have high insulin levels in your blood stream, your body starts to store the food you are eating as fat. YUCK! And that’s not all. Carbs mess with a whole bunch of things in your body. They are the ones that actually cause heart disease, along with diabetes, strokes, sexual disfunction, cancer and possibly Alzheimer’s. Bacon (a complete source of protein) has one of the highest amounts of essential amino acids available. Our body can not produce amino acids. That is why it is so important for us to eat things that can supply our bodies with them. Veggies do not offer complete proteins. So to all of you vegans out there, please make sure you are supplementing (with bacon – hahaha – jk). It contains selenium. And this stuff is so good for you!! It actually helps to prevent the hardening of arteries (heart-disease). Did you know that selenium also helps prevent certain cancers (potent antioxidant)? It can also maintain a healthy thyroid gland and protect the body from rheumatoid arthritis (RA). 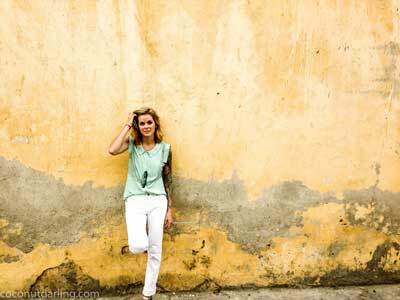 I could go on and on with the many ways selenium benefits, heals and protects our body. Seriously. Bacon is loaded with phosphorus. This happens to be the basic building block of our DNA. It also contains ATP, which is an energy molecule that creates muscle movement. You fryin up that bacon yet!? That all sounds grrrreaaatt! Right? One small factor (which I mentioned early) – moderation. Oh, and maybe another thing – quality. Well, it can be pretty disgusting. If you want to know the truth, the whole truth and nothing but the truth, start here. Don’t worry, I understand if you’d rather not know. And if that’s the case, just take my word for it…pastured raised or free-range is a way better option then conventional or “grass-fed”. To be honest, you don’t really know what you’re getting either way. All farms are different and all pigs are different. But, just so you know, pigs don’t “just eat grass”. And you are what you eat, right? The nutrition we are “supposed” to get from pigs is not what it’s supposed to be when the pig is not getting the correct nutrition. On top of not getting the correct nutrition, it is eating toxins and an over abundance in certain nutrients that put it at unhealthy levels (omega-6s – inflammatory). Pigs (and other animals) that are allowed to range freely are able to eat more of their “natural” diet. This naturalizes and normalizes their nutritional value for us during consumption. Pigs that are raised on a pasture contain more Omega-3 (anti-inflammatory). We want a happy ratio of the 6 and the 3 (1:1-4:1). I also have to admit that pigs are gross. They hold tons of toxins just based on what they eat and how they process their food, as well as the fact that they don’t sweat. And even worse, most of these toxins reside in the fatty fat best part of a pig. So, sho nuf am I going to eat the cleanest pig out there!! I don’t need all of those extra toxins. You get what you pay for, right? So, now ya know. The good, the bad, and the ugly. I have a love/hate relationship with the humanity of animals. Of course, I never wanted to see what actually happens at the processing plants. Thanks to YouTube my eyes are no longer virgin. I’m hoping the farms that tout humane raising of animals are true to their cited values. We can only hope, and pay the difference to support it. I support humanely raised animals. I do eat them, cuz’ their good and God said I could. Animal protein is a part of the puzzle piece of our body (I believe). I don’t just buy expensive meat to have a “vain attempt” at “something”. And I hope that all came off as sincere and from the heart as possible. No nectarines? Use peaches. This would be amazing with peaches! I just enjoy coming up with recipes for things that are “on their last leg”. I challenge you to do the same. Save the food!! I’d love to hear about your food saves. Also, feel free to share some beginner gardening tips!! 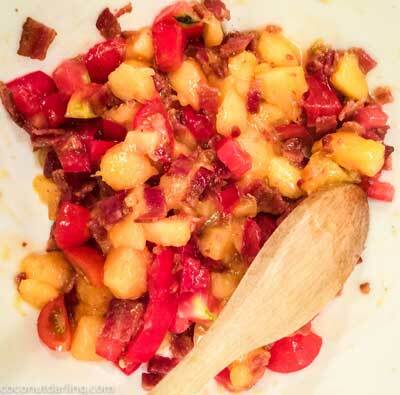 Combine the diced tomatoes, nectarines and bacon. 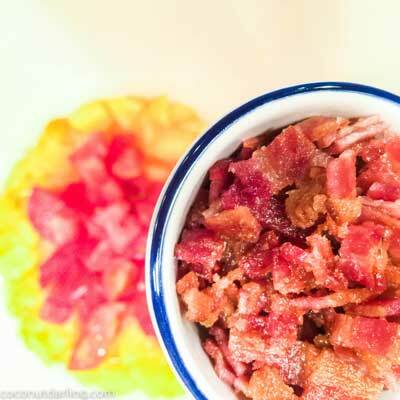 Mix all of the dressing ingredients together and then pour it over the fruit and bacon. Mix well. Allow the flavors to blend together as you prepare your choice of meat.